The hurdy gurdy was not the only unusual instrument I used for this score. I also wrote for Paul Cartwright on the electric fiddle. 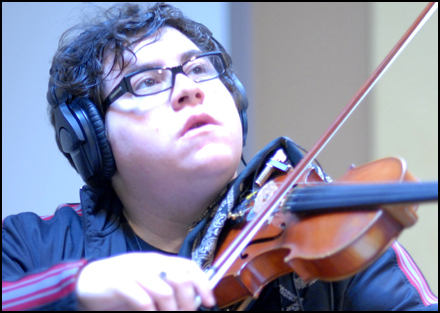 Paul’s a fantastic instrumentalist I have worked with on virtually every project I’ve ever scored. He was featured prominently throughout “Battlestar Galactica,” “Terminator: The Sarah Connor Chronicles,” “Dark Void,” “SOCOM 4,” and “Caprica” just to name a few. Paul is able coax an absolutely other-wordly sound from his instrument, combined with his collection of effects pedals and amps. But, in addition to unique sounds, he also has a strong feel for country and bluegrass music. This combination makes him perfect for “The Walking Dead,” and I had already used him in Season 1, for the episode Vatos. SPOILERS AND SECRETS AHEAD: For Secrets, I wrote solos for Paul that underline the episode’s escalating tension. The first place you will hear the electric fiddle is when Patricia is preparing the chickens to feed to the captive zombies. (One of the most gruesome scenes yet, especially once the bone-crunching sound effects were added! But don’t worry, no chickens were harmed in the filming.) As she heads toward the barn, Paul’s lonely electric violin whispers behind her, adding an ominous sense to the visuals, especially the barn. The score is not necessarily commenting on who is right or wrong. That’s for the audience to decide (and you could see it either way). Instead, the music simply suggests that this core disagreement over the nature of the zombie affliction may perhaps lead to more dire conflicts in the future. But, as the fight heats up I added the orchestral strings, drum set, electric bass, guitars and banjos to form a chaotic, pounding texture. The last cue in the episode is when Dale confronts Shane and tries to get him to leave. Shane gets that wild look in his eyes again, and I brought back the rhodes and electric bass pattern I first introduced in Save the Last One. This musical echo was meant to remind us that Shane is a killer. This is the darker of the two Shane Themes appearing again. I have fond memories of this episode because of a hilariously failed experiment. My percussionist, Jonathan Ortega, and I wanted to try some altered percussion sounds. So, Jonathan donated his old drum set from middle school to the cause and we completely trashed it. We spent hours hammering, cutting, drilling and bolting pieces of metal to the heads, the body, the sticks… crafting a “Frankenstein” drum set, hoping to create a sound that would be like a drum set but trashier and more zombi-fied. Our hours of labor didn’t pay off at all. No matter what we did to the drums, the effect was essentially inaudible when it was put in the final mix. 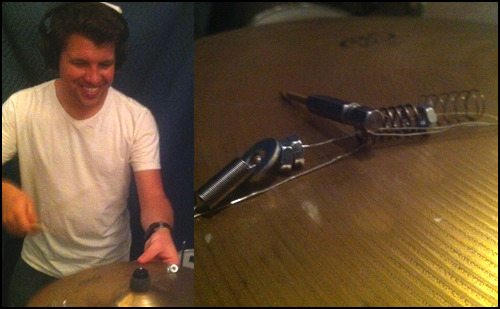 So, we basically ruined Jonathan’s drum kit for nothing. Oh well. Drummer Bryan Taylor had fun playing the trashy drums, and that should at least count for something, right? Next week’s episode, the last before a mid-season break, has some of the best music I’ve written yet for the series. You guys are going to love it!